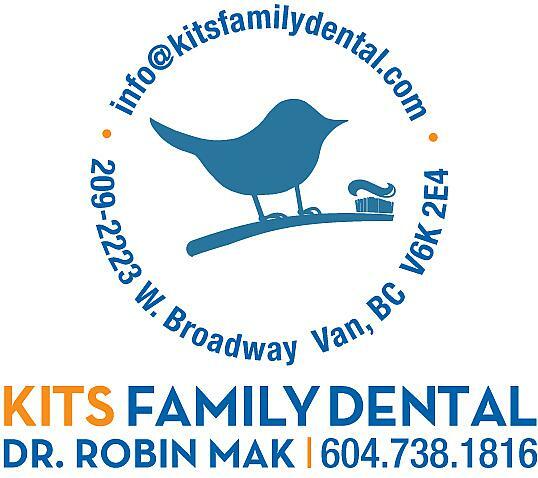 Kits Family Dental is conveniently located in Kitsilano, with flexible morning, evening, and weekend hours to easily accommodate your entire family. Our office treats patients of all ages, from your baby at 6 months old, to people well into their retirement years. This healthcare professional has not released any appointments on Connect the Doc. Call them at (604) 738-1816 to book an appointment. - There is an underground parking lot which charges $1.00/hour. You enter the parking lot from Yew street. - There is metered parking on Broadway street. - You may be able to find free parking on Vine street, Yew street or 7th ave. So what should you be doing to deal with your tooth trouble until you can get emergency dental care for your child or yourself? What should I do if I lose a filling? Pain is the issue here. If you’re not in any pain, simply keep the area clean and see your dentist as soon as you can. If it hurts, take clean tweezers and grab one of the cotton pellets. Dip it in a little bit of clove oil and place it in the tooth. Don’t just dab it; put the whole cotton pellet in the tooth and leave it there. This should minimize the pain until you can get to a dentist. Caution: NEVER put an aspirin on your tooth or gum. Aspirin is an acid and can burn the tissue. What do I do if I knocked out a tooth? Hold an ice-pack over your mouth where you lost the tooth to minimize swelling. Very gently rinse off any debris, but DO NOT scrub the tooth. Hold the tooth in your mouth, between the cheek and gum, to keep it moist. But if it’s not possible to hold the tooth in your mouth, submerge the tooth in a glass of milk or gently wrap it in a clean, damp cloth until you get to your dentist’s office. No matter where you hold the tooth, get to a dentist as quickly as possible. It’s likely the tooth can be saved IF you get to the dentist within 30 minutes of losing the tooth. Teeth that have been knocked out will almost always require a root canal, but they can often survive for years if treated within one hour after the injury. What do I do if a tooth becomes dislodged or loose? What do I do if I chipped my front tooth? Hold an ice-pack over your mouth to minimize swelling Try to keep the fracture piece – sometimes it is possible to bond it back onto the tooth If the chip is very large (more than 1/3 of the tooth surface), you may have exposed the nerve of the tooth. 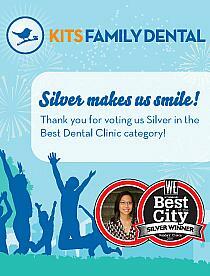 Get to a kitsilano dentist immediately. 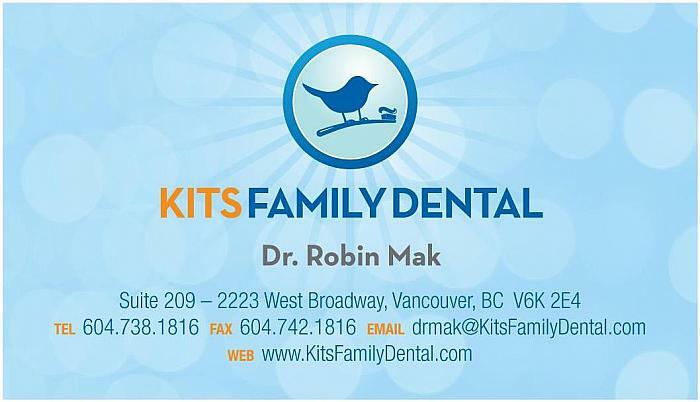 Dr. Robin Mak from Kits Family Dental sees a 2 year-old child for her dental visit. Dr. Mak completes a full pediatric examination, shows her parents how to brush and floss, and cleans and polishes the child's teeth. Dr. Mak was recommended to me by a colleague a couple of years ago, a young professional starting up her practice. I was hesitant to book an appointment, not because of her, but because of my own dental hygiene (embarrassingly bad). I made the appointment, and she made a 2 year plan (inside my insurance coverage) to fix my teeth up. She didn’t tell me as much, but it’s hard not to guess with the dental repair schedule I had. Dr. Mak also removed 2 of my wisdom teeth. I had no pain, and it was over in about an hour. When she saw my other 2 wisdom teeth were not completely exposed (impacted, I believe the term is) she recommended Dr. Eugene Sam, an orthodontic surgeon she has scheduled in her office Mondays, to remove the other 2. Well, I postponed the appointment a few months due to work and travel, but today the other 2 teeth came out, and I must say Dr. Mak’s resident specialist did a great job. My lower wisdom tooth was partially exposed, and it required some cutting. Dr. Eugene calmly explained what the process would be, checked repeatedly if I felt any pain, and ensured my tooth removal process was as comfortable as possible. Watching SportsCentre on the TV above me was also a helpful distraction. I’ve also recommended Dr. Mak to my wife, whose father is a dentist in Austria, and she has expressed nothing but positive feelings about her capabilities. Thanks Dr. Mak, your team has made my anxiety about going to the dentist disappear.